Forty years ago, Tulsa’s Caravan Ballroom, not Cain’s, was home to one of the best western swing bands in the country. Ever since early 1934, when band leader Bob Wills and his business manager, O.W. Mayo, brought their group from Waco, Texas, to Oklahoma City – and from there to Tulsa for a far longer stay – Oklahoma has been ground zero for the music known as western swing. Not quite country and not exactly jazz, western swing was, and is, a dance music that flourished in honky-tonk venues like Tulsa’s Cain’s Ballroom, home to Bob and his brother Johnnie Lee Wills for decades. But just as there were other great western-swing bands in addition to the Wills groups, there were other Oklahoma venues through the years that boasted their own top-flight purveyors of the musical style made famous by the Wills boys. One of them was Tulsa’s Caravan Ballroom, which in the late ’70s and early ’80s was home to what may have been the best western-swing band of its era. That sounds like hyperbole, but it’s an assessment made by one of the genre’s best-known practitioners, Texas-based fiddler Johnny Gimble. 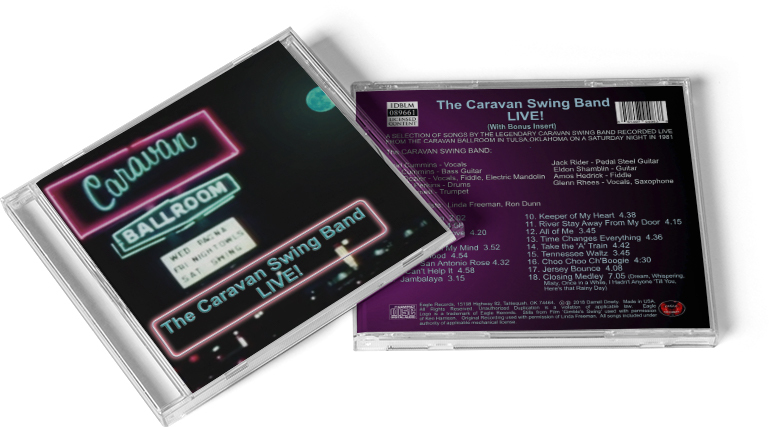 As the bassist for the Caravan Swing Band, Cummins is one of the crackerjack musicians heard on the new disc The Caravan Swing Band Live! Remastered at Tahlequah’s Eagle Studios from an old reel-to-reel tape, it features 18 tracks (including a long closing medley) recorded at the Caravan in 1981. It would be hard to imagine a better outfit: longtime Bob Wills arranger and brilliant guitarist Eldon Shamblin; underrated steel guitarist Jack Rider; fiddlers “Famous Amos” Hedrick and Billy Dozier (also heard on mandolin); saxophonist Glenn “Blub” Rhees; drummer Tommy Perkins; young Turks Mike Bennett (on trumpet) and Cummins; and Jon’s dad, the multi-instrumentalist and vocalist Shirl Cummins, who owned the venue at the time. In addition, the disc features a performance each from “Ron” Dunn – well before his days as half of the most popular duo in country-music history (Brooks & Dunn) – and future Oklahoma entertainment-business figure Linda Freeman (Rider’s sister). Freeman supplied the tape that became The Caravan Swing Band Live! She remembers that it was originally taped by an uncle of hers from New Mexico, a musician who owned some recording gear. On a visit to Tulsa, he took his recorder to the Sheraton Inn-Airport, where she was singing with famed Tulsa guitarist Tommy Crook, and from there to the Caravan. Freeman ended up with the tape, which she kept for years – until she met Eagle Studios’ Darrell Dowty. Dowty adds: “It was 37 years old, but Linda had kept it indoors, never in a garage or attic or anything, so there was a chance that it was good. I ran it through one time on my four-track, and I got a lot of shedding, but nothing broke, and I got a real good digital copy. I told Linda I thought we’d be able to get enough sound out of it to make a CD. There were certainly challenges. For example, it was apparently recorded with four microphones, placed at strategic points around the stage – not the optimum way to record a live music show. Indeed, Dunn (whom Shirl Cummins introduces as “Ron Don”) blows off the doors of the place with his powerful reading of the Hank Williams standard “I Can’t Help It (If I’m Still in Love with You),” the most unabashedly “country” track on the album. The rest of the disc consists mostly of jazz and pop evergreens (“Georgia on My Mind,” “Take the ‘A’ Train,” “Jersey Bounce”) and western-swing standards (“New San Antonio Rose,” “Big Beaver,” “Keeper of My Heart”). Dowty says most of the lead vocals were done by Rhees, with Dozier and Shirl Cummins taking their turns as well. The original placing of the microphones allows the listener to hear a lot of bandstand chatter. With such cutups as Shamblin, Bennett and Rhees on board, one would expect that to be amusing … and it is. One of the members who added much to that creativity was trumpeter Bennett, a University of Tulsa student from Kansas City. Although he’s now a nationally known first-call western-swing player, he was new to the genre when he joined the Caravan Swing Band. That spontaneity is at the heart of western swing, and at the heart of this disc as well. These are great players having a grand time – including Rider, a musician whom Dowty feels is hall-of-fame caliber.